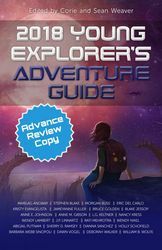 Great stories around a brilliant idea: sci-fi stories for children. There are future technologies, new planets, aliens, apocalypse, children heroes and clear moral lessons. Until most of the stories are great, entertaining and clever, some of them are too negative. OK, life is not always bright, we wouldn’t and shouldn’t lie about it to our children. But a sad and tragic story makes a child more sad and embittered than an adult, I’m not sure it was a good idea to select them to this book. For example: evil robbers hurt your dad who becomes disabled for all his life? (The Sting of the Irukandji) You know you will die in 10 days and you couldn’t do anything, so you are just waiting for it in the library? (Moth Girl) Taking away children’s freedom and even their dreams? (Station Run) You were sold by your mother(! ), an evil scientist makes experiments with your body(! ), and when you accidentally survive that, you start to plan the vengeance, how to destroy the company and all the people in that… (Anjali) Really? Another aspect is the feminists’ point of view: almost all the main characters are girls. I agree that everybody could be a hero: a girl, a child with a disability (girls in wheelchairs: Abduction Assumption, The Altitude Adjustment, a deaf girl: Nocturnal Noise), and even an animal could be a hero (The Smell of Home, Safe in the Dome). But the boy readers will may be disappointed when they will find only one(!) story about a boy hero (After the End), every other one is about girls.